Home > Uploading your event sound track. You can upload your event sound track through the Talent Time website. After you have added a participant along with the events, you will see a "Sound Track" link below the event that needs a sound track. For group events, only the group leader needs to upload the sound track. The file size should be less than 10 MB and in MP3 format. 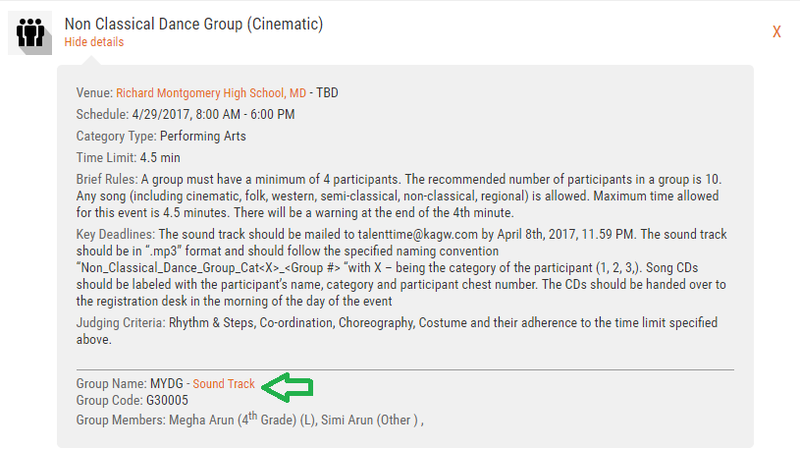 For group events, you will have to expand on the "Show Details" link to see the "Sound Track" link. Click on the "Sound Track" link to bring up the upload window. You have two options to upload when using the desktop version. You can either click on the "Click here to select your MP3 file" button or drag and drop your file into the file drag and drop area within the dotted lines. On mobile, only the button option is available. Once you have selected the file, you have the option to play the file before you click on the "Upload" button at the bottom of the screen. You should use this option to verify your file. After you have clicked on the "Upload" button, the system will show the upload progress and then present you with the uploaded file. Listen to the track and if you need to upload an updated file, follow the same steps for upload and the old file will be overwritten. For membership related questions, email Talent Time 2019 Membership Team. For registration related questions, email Talent Time 2019 Registration Team. To Sponsor an event, email Talent Time 2019 Sponsorship Team. Copyright © 2019 Kerala Association of Greater Washington. All rights reserved.